A friend of mine recently asked why the quality of her lattes varies so much between cafés. Why is it, she asked, that when you go to one café, the coffee is delicious, but when you go to another, it’s barely drinkable? The short answer is that not all cafés are created equal. However, that doesn’t really explain much, so I would like to discuss what goes into making a great (or not-so-great) latte. He was referring to the better cafés in Portland when he made that statement. While what he said may be true, not all cafés are in the ‘big leagues,’ and no matter where you get your latte, the quality is still determined by four main factors. These are the three ingredients—coffee, water and milk—plus the barista, who brings them all together. The quality of these four components is what determines how good your latte is, and as you will see, there are lots of places where things can go wrong. Let’s start with the coffee. First, coffee is an agricultural product, so it has natural variations from region to region, even farm to farm within a region. Coffee companies do not all get their beans from the same place, and that is one source of variability. Second, coffee cherries ripen on the tree branches at different times, and if the pickers are not careful, some unripe cherries get into their baskets. If the green cherries are not sorted out of the coffee, those flavors can show up in your cup. Think of it like any fruit—you wouldn’t want to take a bite of an unripe peach because it would be sour. Unripe coffee is the same way—you need to wait for it to ripen if you want the final product to taste good. Since it costs money to make sure that all the green cherries are sorted out, some companies tolerate a few green ones in return for higher profits. Higher-quality specialty coffee companies (Stumptown comes to mind) only allow the ripe fruit to make it through the sorting process. My point is that some companies have better beans to start with than others. In addition to the green coffee quality, the blend of the roasted beans is very important to your drinking experience. This is one point where your taste preferences come into play. You might prefer a balanced, low-acid, Italian-style blend, or you might prefer a tangier Northwest blend like Hair Bender. In Portland, many people are learning to like single-origin espressos, which are very different from either the Italian or the Northwest blends. Different cafés have different types of espresso. The darkness of the roast matters too. The darker the roast, the more smokiness (some would call it char) flavor you will have in your drink. I’ve met more than a few people who think that Starbucks over-roasts its espresso, but I also know people who won’t go anywhere else. It depends on what you like. The freshness of the roasted beans is another factor that determines quality. Generally, the fresher the beans are, the better the espresso is. After they are roasted, the beans should sit for a day or two to allow the oils in the beans to stabilize (this improves the richness of the crema), but then they should be used as soon as possible. One barista I spoke with told me that the quality of the espresso is not as good on days 8 and 9 after it is roasted (days 2-7 and 10-14 are better). Critics of the larger coffee companies claim that the companies do not pay enough attention to the freshness of the beans. These companies’ coffee may sit in bags for months before it makes it to your cup. Using vacuum-sealed bags helps maintain the beans for longer periods of time, but even the best bags with special one-way degassing valves still expose the coffee to some air, degrading its flavors over time. Freshness also depends on customer turnover. A coffee shop that has decent traffic should go through beans quickly, but if you come across one that makes only a few espresso drinks per day—a café that focuses primarily on food, for example—you might be getting coffee made with stale beans. You can get some pretty awful tasting espresso without much crema if you use stale beans. The beans must also be ground correctly before brewing. A very fine, consistent grind is important to make the best espresso. A café needs to use a high-quality burr grinder to get this. If the grinder is out of calibration or if the burrs are dull, the quality of the drink will suffer. As you have probably noticed, there is a lot that can affect the quality of the coffee itself, but coffee is just one part of the equation. Let’s move on to the water. Water is almost as important as the coffee. If a café does not filter its water, all of the water’s flavors go right into your cup. Starbucks, for example, triple-filters its water so that you only taste the coffee. Any quality café will filter its water, unless it happens to have perfect-tasting spring water. For the espresso to be great, the water temperature needs to be held constant (just below boiling) throughout the time the shot is being pulled. If the water is too hot, the espresso will be bitter. If it’s too cold, it will taste flat. If you happen to come into a café during a lull, the machine’s temperature may be too low. A good barista will know this and pull a warm-up shot to get the group head back up to temperature before making your latte. If you have good coffee and good water, you will want good milk too. During our conversation, one of the first things the baristas mentioned was the importance of using good milk. According to them, there is a major quality difference between milks. If you use the wrong one, it does not foam as well and the latte ends up tasting cheap. Finally (whew! 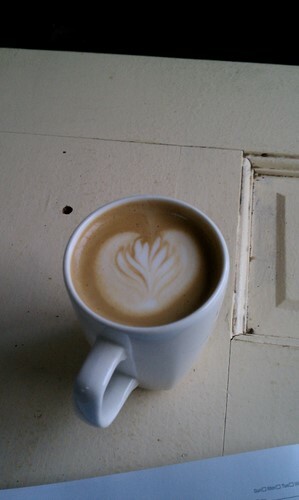 ), the barista’s skills are very important. You can almost taste the passion that a good barista puts into making a great latte. Good baristas make sure the machines are clean and running properly, they know how much espresso to dose out and how to tamp it correctly, and they care about what they are doing. They foam the milk so that it has a smooth, velvety consistency, and then bring the milk and the espresso together as soon as the shot is done pouring. This timing is important, and not all baristas are careful to get it right. As you can see, while there are only three ingredients that go into making a great latte, there are many points during the process where things can go wrong. You need good beans, clean water, the right temperature, quality milk and a skilled barista to bring it all together at just the right time. With so many variables, you are bound to find differences between the cafés, and that is why your lattes are inconsistent.